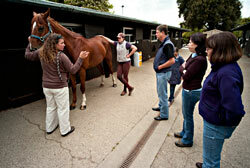 ECS 2 - The Evolution of the Equine - "Unwinding"
Each workshop is conducted over four consecutive days. Part of each day is devoted to the study of specific cranial bones of the horse. A genuine horse skull and detailed slide are used to help correlate, anatomically, the hands-on techniques taught throughout the course. A significant amount of time is devoted to practical work with horses, so that students can develop the skills necessary for addressing each individual horse's needs. We also welcome other Equine professionals... trainers, vet technicians, farriers, riders, and owners who have an interest in learning Equine CranioSacral work. Previous CranioSacral training is not required, but it is beneficial. Previous horse handling experience is required. There are five four-day classes in the Equine CranioSacral series. Equine CranioSacral 1 (ECS 1), is a prerequisite for all further classes. Equine CranioSacral 2 (ECS 2), is the next class to take. Contact Equine CranioSacral Workshops if you have any questions regarding the classes/workshops. Safety is a priority in our workshops program, for both the horse and student. Please note, we require all students attending to adhere to our program guidelines. Students, upon successful completion of workshop, will be given a certificate of completion for hours attended - for materials studies anatomy, theory and hands on. Replacement of a certificate of completion is $10. Equine CranioSacral Workshops participant registration deposits and/or workshop payments are not transferable to another registrant/student. If a student requests to transfer a payment from another workshop they registered for, this cancels their registration for that workshop - please see our cancellation policy.